There is nothing more Australian than having a swim in your backyard pool or spending endless hours at your favourite beach. Many Aussie adults feel an overwhelming sense of nostalgia when they recall countless childhood hours spent in and around th water. As more and more families move closer to the urban lifestyle and farewell suburbia, we feel that our kids are perhaps missing out on making those same cherished childhood memories. 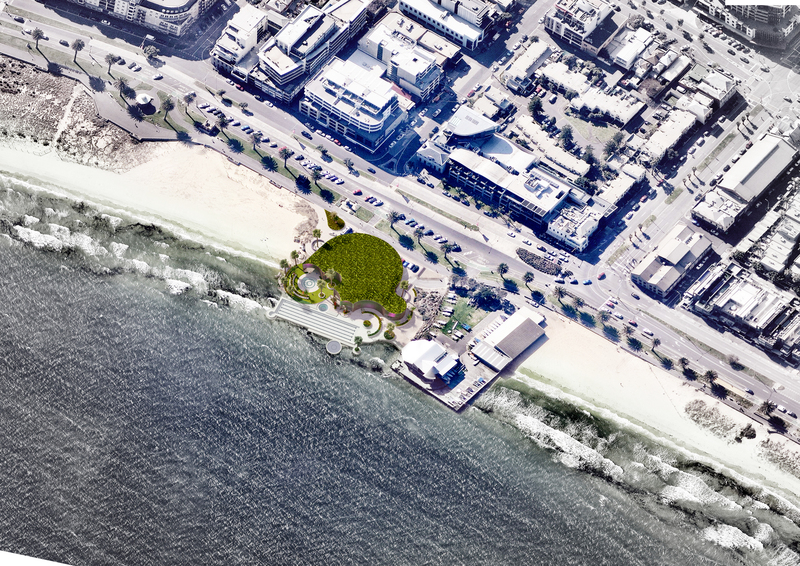 The solution, a public pool by the beach! Monique & Scott Woodward of WOWOWA collaborated with Andre Bonnice to create these beautiful images that aim to bring the project to life. We want to host information events to galvanize a ground swell of support and enthusiasm. We have already exhibited the pool at a 500-person trivia evening at the Port Melbourne Primary School which was held back in June. The idea was extremely well received by parents and locals. People loved we were keeping the car park but building over to create a new entry and shaded under croft area, they loved the opportunity to upgrade the outdoor deck area of the PMYC and loved the palm trees. This approach of ‘grass roots project generation’ is modern and exciting. We are here to listen and to engage and welcome constructive feedback. We hope this campaign will generate enough enthusiasm to render this a real project and in turn get funding like most other civic buildings of its scale. The want to avoid the momentum of this project sliding – the last thing we need is for it to get put on the back burner again. In a similar bid to secure funding for a community project, WOWOWA has recently been involved in the successful bid to build at extension on the Narre Warren Football & Netball Club. This process also involved attracting media attention, raising money and designing/documenting the site. Construction is scheduled to begin later this year. 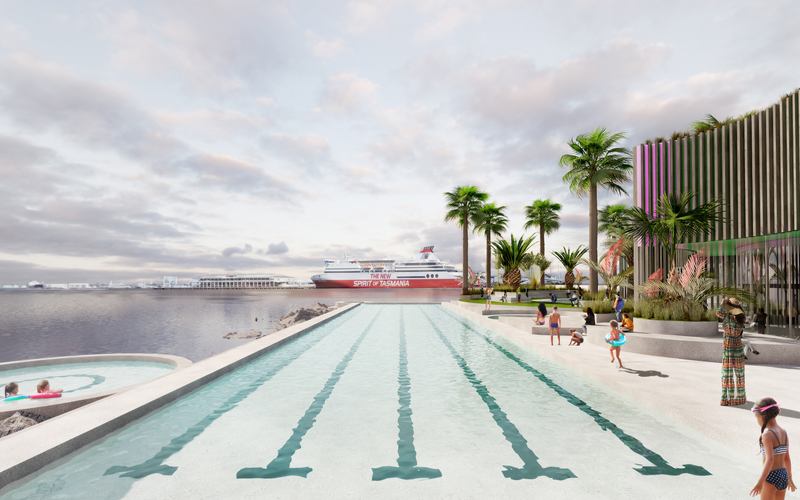 We hope we are also able to provide the community of Port Melbourne with a central hub – a place for all to learn how to swim safely. Many thank-you's, Community Workshop, WOWOWA Vintage Posters, 1yr Unlimited Swims, WOWOWA Rosella Pendants. Email or post us a copy of your letter of support written to the City of Port Phillip or local member to also claim a spot on the contributor 'Board of Champions'. We also plan to organise a free seaside information session so stay turned. 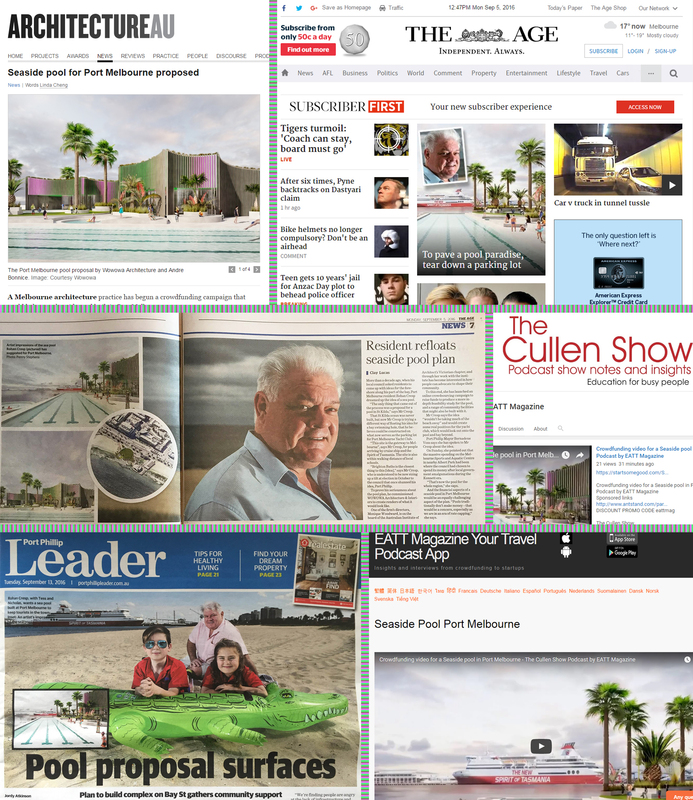 WOWOWA Architecture & Interiors has produced some exciting visualisations of a seaside pool but to realise a project like this, political will & support is necessary and that comes from the people. People coming together, talking and getting excited about what Port Melbourne needs and how to best achieve a great outcome. We want locals, business owners & pool enthusiasts to dive in and donate today to allow WOWOWA to do a more in-depth feasibility study. This study will launch with a workshop and information session and hopefully end with Government and Council funding. We need a diverse project team of experts for this project to come to life, part of the feasibility will be articulating the right team. Let's make it impossible for a major player not to get on board by crowdfunding Phase One 'Investigation & Concept Plan' consultant fees. WOWOWA Architecture & Interiors will need a fabulous project team including a Project Manager, Engineer, Mechanical / Electrical / Hydraulic Engineers, DDA (especially disabled wheel chair access to the beach), Environmental, Pool & Sustainability expert, Landscape Architect, Land & Building surveyors. Phase One will be about developing a robust design & set of drawings that incorporate the expertise of all involved and the incredible feedback we anticipate receiving from the local community. With this money we can also produce a model of the proposal allowing everyone to see their brand new civic space & recreation facility. 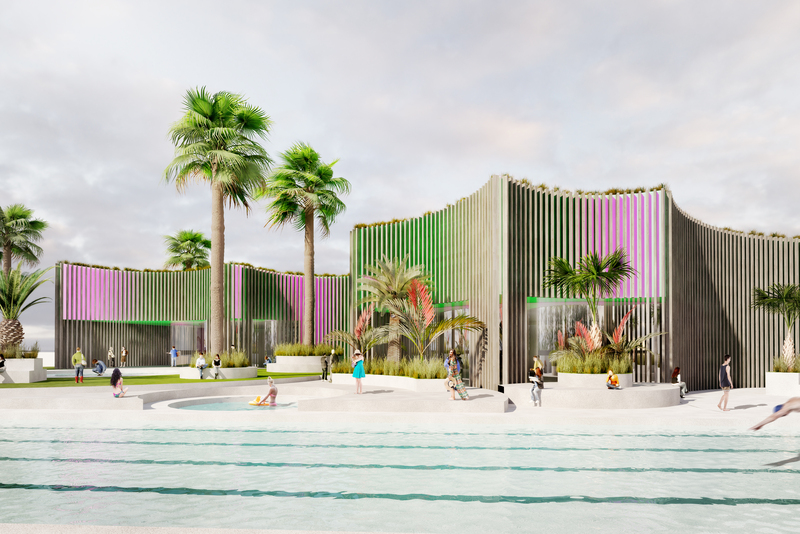 Phases Two (Final Design), Three (Documentation) & Four (Construction) will need to be funded by key contributes to ensure our Board of Champions hangs pride of place in Port Melbourne's new seaside 'pool room'. Let's make it impossible for a major player not to get on board by crowdfunding Phase One 'Investigation & Concept Plan' consultant fees. WOWOWA Architecture & Interiors will need a fabulous project team including a Project Manager, Town Planner, Engineer, Mechanical / Electrical / Hydraulic Engineers, DDA (especially disabled wheel chair access to the beach), Environmental, Pool & Sustainability expert, Landscape Architect, Land & Building surveyors. We would love to host a beach side workshop & community information session (weather permitting) or at the PMYC. 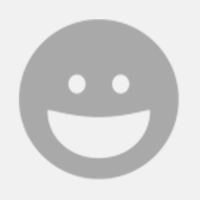 Your feedback is super important to us! Name on Board of Champions. WOWOWA's beautiful A1 posters were created for an exhibition and are usually sold for $440. We have a framed pair in our Rathdowne st studio shopfront - come check them out! Name on Board of Champions. Can you almost feel the water as you dive in! We thought so, thank-you for your donation. Name on Board of Champions. Sold in a pair because Rosella's mate for life, if you donate $1700 you'll receive two of the gorgeous WOWOWA designed copper pendants. Name on Board of Champions. A roundtable lunch with top Melbourne Architects at a fancy Port Melbourne restaurant. Dine with Clare Cousins from Clare Cousins Architects & Amy Muir from Muir Architecture.